Doodle is sensitive. New people scare him; men, in particular, stress him out. He’s come a long way since he came home, but it doesn’t take much to trigger a tail-tuck, ears flattened, coat blowing, eyes-wide panic pupttak. Yesterday, I took Zo to the vet. Right after Thanksgiving, he had a small cut on top of his paw that he licked so much that he removed all of the hair around it in a perfect circle. We cleaned and treated the wound, and kept it covered so he wouldn’t agitate it further. It healed. Hooray. Then after New Year’s, he started compulsively licking at the same spot. There was an abrasion, and the hair pattern was taking on crop circle patterns. Time to call the professionals. After work, Zo and I hopped in the car, seat warmers a-toasting, and made our way over to the vet. Parking was a nightmare, since it’s freezing and everyone was fighting for spaces that required as little outdoor exposure as possible. Oh, and the vet’s office is in the same complex as a Gold’s Gym, and the Resolutioners were resolving… Noise, traffic, people, strange smells. Eyes, ears, tail. Poor guy. 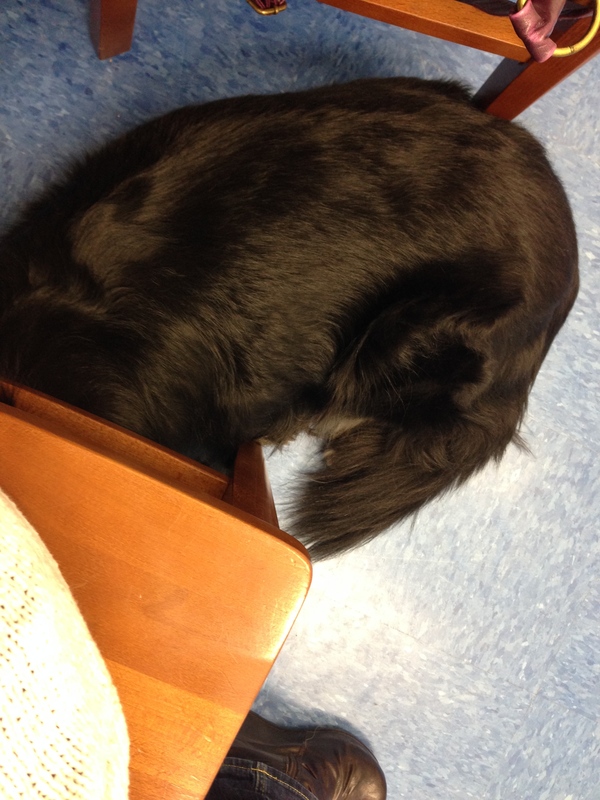 Once inside the vet’s office, he settled as best as he could by fortressing up under my chair. The vet saw us quickly: a new-to-us male doctor. Treats were issued to bribe friendship. Zo has always been food-focused, and it calmed him down enough for his check-over. His foot spot? Scabbed and healing. It looks good and clean. But there’s some discoloration from the attention Zo has been paying to the spot. He can take some medicine to help it heal. Dr. R.: We see this sometimes with nervous dogs. They fixate on a behavior until it becomes habit. Me: So, he’s licking his paw because it’s a neurosis? Dr. R. (Oh, he’s a Brit): Yes. The steroids will take down the inflammation, and he’ll stop agitating his paw. Me: He’s come a long way since we brought him home so many years ago. This is the first time he’s ever done something like this to himself! Dr. R.: It could be this is the only time this will happen. It could be that the nervousness escalates. If it ever gets to the point when it’s too much, we can put him on medication to help with the symptoms. Prozac or Xanax. And there it is. The words that I knew in my bones would come up at some point in relation to Doodle, but that we never hoped to hear. When he’s calm and comfortable, or when we can get in front of his discomfort, he’s mellow and a dream. Part of me thinks this is actually something in our future: a dog who we just can’t get through to anymore, no matter what jobs we give him to do, emotional padding we envelop him in, and positive reinforcement and praise we give. And we’ll wait as long as we can to make a decision like this, so long as Zo isn’t completely miserable or licking his own legs bald. 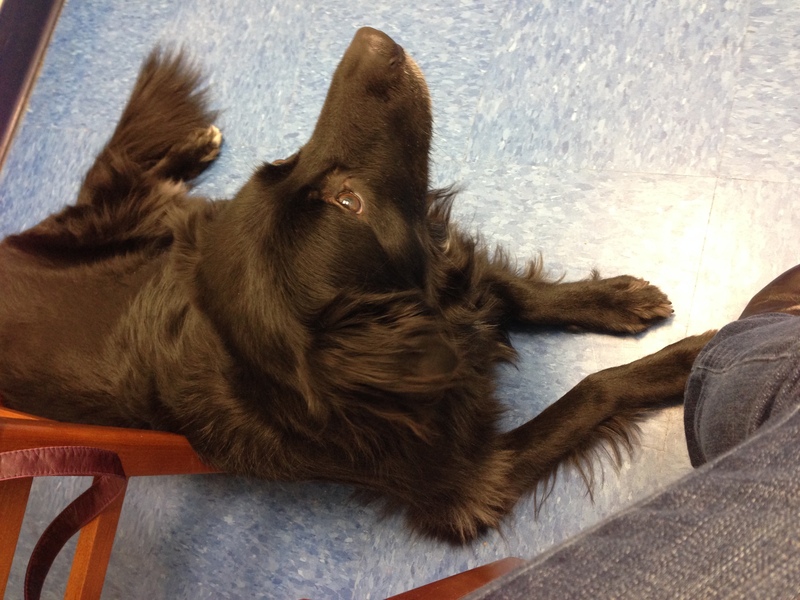 Anyone out there have a nervous dog that needs a little pharmacological assistance? What have your experiences been with meds? Anyone try anything more natural as a calming agent? Overreacting? Probably. Overthinking? Definitely. But I’m a worrier. This entry was posted in 2014 and tagged Caring Hands Animal Hospital, nervous dogs, rescue dogs, veterinarian, Zo, Zozo by klgf. Bookmark the permalink. Ho, boy. I’m happy to talk more offline as I could go on awhile, but yes, very much so. When we first got Beatrice she was too terrified to leave her crate. For weeks. We tried various options, and finally, after the vet and a behaviorist agreed, put her on Prozac. The idea is not to super-medicate her, but basically just to take the edge off, to allow her to build confidence by experiencing things (in her case originally, ANYTHING) she just would not have the courage to do on her own. She just needed a little boost. Our results have been AMAZING! It really was exactly what she needed. Now that she has been on it for about a year, and is a totally new dog, we are going to talk to her vet about weaning her off, to see if she can manage without it. We were strongly opposed to the idea at first, but it really was the best choice for her. I don’t mean to try and sell you on meds, but we were really adamant that we’d never medicate a dog like that before, and have definitely learned it *can* help. Please holler if you’d like to talk about it more. We don’t have a nervous pup, but we do have a nervous cat. A nervous cat with bladder issues. He would get nerved up either when someone new came over or if we left for the weekend, and it would agitate his bladder issues and then- pew! He peed on the bed! Or he’d pee on the couch. Or the bed again. It was a serious issue. We almost put him on kitty-Prozac, I was ready to!, but we were able to sort his bladder issue out with special food. He was a Beijing street cat as a kitten, before we rescued him, so I wasn’t surprised he was such a nervous beastie. I was willing to do what it took to help him out- being on antidepressants myself I know first hand what a difference they can make. And I can talk! All Ed could do to let us know he was having a hard time was hide away and/or pee on our stuff! He’s much better now (tho we still don’t let him in the bedroom unsupervised). Kind of rambling but I hope it helps. What a happy ending! Thank you for sharing your story with us! My Target (cat) used to be a serious nervous kitty but five years of love and he’s now furry brave – except with strangers. Best advice? Keep at it and don’t let your worry affect your pet. He’ll be all right, really, just relax and let time heal.